The Nik Meller Collection of elegant premium grade optic crystal Awards are designed by International furniture designer and sculpture Nik Meller. 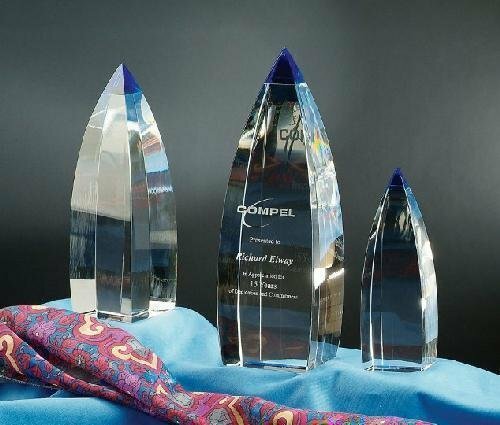 The Vetri Crystal Award has a clear crystal square shape with curved surfaces rising to a principal peak highlighted in cobalt blue crystal. 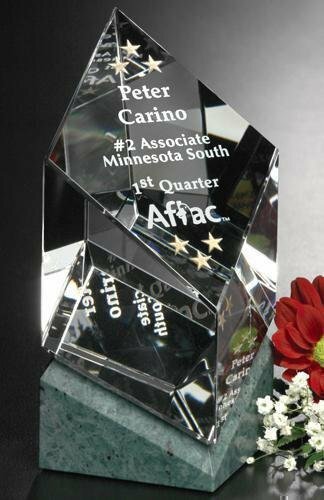 The Vetri Crystal Award is suited for designating great accomplishment for recipient's in any field. Available in three standard sizes. Custom sizes and multiple color combinations available upon request. The Vicksburg Award combines regal green marble with flawless clear crystal to create an eye-catching award. This award is ideal for honoring individuals who display commitment and dedication to corporate ideals.